Myelodysplastic syndromes (MDS) represent a group of myeloid (bone marrow) stem cell disorders that gradually affect the ability of a person's bone marrow to produce normal red blood cells, white blood cells, and platelets. Bone marrow is a semi-liquid tissue that is inside many bones such as the backbones, shoulder blades, ribs, pelvis, and stomach. The hematopoietic (blood-forming) stem cells in the bone marrow are responsible for producing and forming new blood cells. Erythrocytes, or mature red blood cells, help transport oxygen. White blood cells, (leukocytes) are one of the most critical elements of the circulatory system because they help protect the body against infections caused by foreign microorganisms such as bacteria and viruses. Platelets are the smallest cells in the blood and are formed in the red bone marrow. They help control bleeding and bruising. People with myelodysplastic syndromes have a risk of the disease progressing to acute myeloid leukemia (AML), which is a bone marrow malignancy. Some studies suggest that AML is a natural progression of MDS and not a separate disease. In some people, MDS may gradually progress over a period of many years while in others it progresses rapidly to AML. The risk of myelodysplastic syndromes increases with age as the disease commonly affects older people between the ages of 58 and 75. It is estimated that MDS affects 15 to 50 people per 100,000 Americans who are over the age of 70. Up to 20,000 new cases of myelodysplastic syndromes are diagnosed each year. However, since there are no actual registries listing the incidence of myelodysplastic syndromes, some researchers estimate that the numbers may actually be much higher. For example, anemia in older individuals may be ascribed to "old age" without consideration of the possibility of myelodysplastic syndromes. The incidence of myelodysplastic syndromes in children is only 5% to 7% of all pediatric hematologic malignancies. It has been reported that up to 17% of childhood AML may result from a prior myelodysplastic phase. About 2% to 3% of all cases of juvenile leukemia are associated with juvenile myelomonocytic leukemia. If you or a loved one has been diagnosed with myelodysplastic syndromes (MDS), it's critical to learn everything you possibly can about this condition so that you can make informed decisions about your treatment. That's why we created the Medifocus Guidebook on Myelodysplastic Syndromes, a comprehensive 189 page patient Guidebook that contains vital information about MDS that you won't find anywhere in a single source. The latest theories regarding the underlying causes of MDS. The risk factors that can increase a person's chances for developing MDS. The signs and symptoms that are associated with MDS. How MDS is diagnosed based on factors such as signs/symptoms, patient history, physical examination, special blood tests, and chromosomal abnormalities. Intensive chemotherapy for patients with MDS with a class of drugs known as demethylating agents, including the side-effects associated with these medications. The role of stem cell transplantation in the management of patients with MDS, including the risks, benefits, and complications associated with this procedure. Supportive treatments that are commonly used to manage anemia (abnormally low red blood cell counts) and neutropenia (abnormally low white blood cell counts) in patients with MDS. The treatment and management of MDS in infants and children. The role of complementary and alternative therapies in the management of patients with MDS. The prognosis (outlook) for people with MDS and important prognostic factors that have a significant impact in predicting the overall chances of recovery and survival. Quality of life issues such as sleep disorders, fatigue, weight loss, and psychological stress that often confront people with MDS and tips for how to minimize their impact and better cope with these important issues. Important questions to ask your doctor about MDS. A Guide to Recent Medical Literature on Myelodysplastic Syndromes - This section of the Guidebook contains an extensive bibliography of over 100 references to recently published articles about Myelodysplastic Syndromes in authoritative, peer-reviewed medical journals with links to the absracts (summaries) of the articles. These articles represent the latest advances in the field and focus on cutting-edge research, new developments, and the lessons learned from recently published clinical trials involving patients with Myelodysplastic Syndromes. This is the same level of that is used by doctors who treat people with Myelodysplastic Syndromes to keep abreast of the latest developments and breakthroughs in this specialized field of medicine. Centers of Research for Myelodysplastic Syndromes - We've compiled a unique directory of doctors, hospitals, medical centers, and research institutions with special interest and, in many cases, clinical expertise in managing people with Myelodysplastic Syndromes. The "Centers of Research" directory is a valuable resource for quickly identifying and locating leading medical authorities and medical institutions both within the United States and other countries who are considered to be at the forefront in clinical research and treatment of Myelodysplastic Syndromes. You'd have to spend days - or even weeks - attempting to compile your own list of doctors and medical centers but, with the "Centers of Research" directory, the information is already right at your fingertips. All you have to do is act on the information by selecting and contacting the experts or medical institutions listed in the directory by state and country. Organizations and Support Groups for Myelodysplastic Syndromes - The Guidebook also includes a directory of organizations and support groups whose goal is to help people with Myelodysplastic Syndromes by providing access to information, resources, and services. Many of these organizations can answer your specific questions, enable you to "network" with other patients, and provide guidance in areas such as financial, social, or medical-legal issues. This valuable directory of organizations and support groups includes complete contact information, including phone numbers and E-mail addresses. 20% Discount - For a limited time, you can purchase the Medifocus Guidebook on Myelodysplastic Syndromes at a special 20% discount off the regular list price. Your 20% discount will automatically be applied when you go to "Checkout". Order Your Copy of the Medifocus Guidebook on Myelodysplastic Syndromes Today! The Medifocus Guidebook on Myelodysplastic Syndromes is available in the following two convenient formats: Printed and Digital. 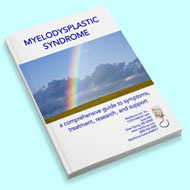 "I purchased the MediFocus Guidebook on Myelodysplastic Syndromes to help my father understand the disease that he has. Doctors in France do not communicate very well the various treatment options neither do they tell you about the prognosis with enough clarity and confidence. We live in France and we believe there is no equivalent in Europe to the service you offer. We have read the Guidebook attentively and have learned a great deal about this condition. The wording is simple enough to be understandable even for non-native English speakers. It was money well spent!" "Your MediFocus Guidebook on Myelodysplastic Syndromes has been a valuable companion in providing wise counsel to a beleaguered soul. Many times I was comforted by knowing that I could have my questions answered correctly and completely by using your Guidebook. I wouldn't be without it for anything. Thank you again and again." "Your Medifocus Guidebook on Myelodysplastic Syndromes has been extremely valuable to me in understanding the complicated disease that afflicts me. It can be very depressing but to understand it intellectually can be very calming and heartening. Fear of the unknown is most devastating and your Guidebook provides the facts in an understandable way without 'watering-down' the science. Thank you for your outstanding publication."